Without giving away too much that might detract from your enjoyment of the game, let's take a tour of the dungeon, check out some of the more difficult puzzles, and introduce you to those charming monsters. The first level you encounter is where the Hall of Champions is located. Here is where you'll select the party of four brave souls that you will guide down into the dungeon. Once you've assembled the group, and found the exit into the dungeon, the game begins. This level is safe from danger and merely serves to introduce you to the things you'll see later on. You'll find food and supplies and learn how to work the doors. Your first magical-spell scroll is here, as is an Altar of VI where you can resurrect the bones of party members who are unlucky enough to die. 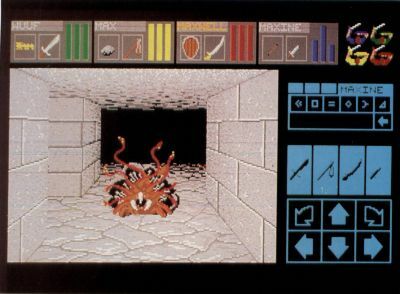 Unlike the first level, which is well lit, the second level is dark and gloomy until you either light a torch or use magic to create some light. From this point on you'll have to maintain your own source of light. This is important because there are many tiny details to watch for and many items which may be hard to see in poor light. Grey keys on the grey floor are one example. This level is still mainly an introduction to the dungeon. You'll fight your first monsters here and learn how to use the weapons you've found. There are many puzzles on this level, but most of them are easy to solve and just serve to show you the kinds of things you'll be encountering later. If you run into anything which seems to stop you cold, try getting very angry with it. The keys on this level are all out in plain sight, but as mentioned before, you'll have to watch very closely to find some of them. Be careful of falling into pits while your party is still fairly weak. While there are some items of interest in pits, the damage you'll take from falling might be fatal. On this level you'll fight Screamers and Mummies. The Screamers are slow moving and not too dangerous if you use the strategic retreat, or "jump forward, hack, and jump back" method of fighting them. The Mummies, however, are fast, so you'll have to retreat quickly to avoid being badly injured. Remember to throw weapons at them! The third level gives you more difficult puzzles to solve and more dangerous creatures to fight. The Blue Trolls with their nasty clubs can be fatal if you let them hit you. Get them from a distance if you can. The Rockpile Monsters on this level are slow, but hard to kill. Even worse, their bite is poisonous. The poison is only temporary, though, so you don't necessarily have to use a "Cure Poison" potion. Again, throw things at them, and use the strategic retreat. Another thing this level teaches you is the value of slamming a door in a monster's face and resting safely on the other side. You can always retreat into the large central room and sleep to regain your health and mana, as long as you remember to close all the doors. This level has two puzzles which require quick movement. Be sure none of your party is carrying too much to move quickly. Their LOAD indicators should not be yellow. If any of them are, have them drop items. If you find a compass, use it in the Matrix room to show you the action of the invisible "spinner" fields. In the Chamber of the Guardian, persistence will pay off. You'll need to search the large central room to find something you can use to pay for entrance to the Vault; then you'll need to use magic to open a door you can't reach. Once the door is open, you'll see what you need to do to close the pit in front of the door. The Time Is of the Essence room is the second area where you need to move fast. Where it says "Hit and Run," do exactly that to the button on the wall. If you run to your left fast enough, you'll see what to do next. The Room of the Gem is fairly straightforward, once you've used something to close the pit; but watch out behind you, as another action you take may trap you! Also, be very watchful around corners, or you may find yourself sandwiched between pairs of Rockpile monsters! This room gives you the opportunity to drop monsters into a pit, something that while not giving you any experience points, is at least satisfying to do. Creature Cavern is just what the name implies. Be ready to do a lot of fighting in there! You will need at least four gold keys to proceed to the next level and a fifth one to open a room near the end. 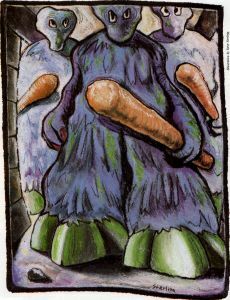 Just when you think you've learned to survive whatever the dungeon can throw at you, level 4 feeds you to the Purple Worms. This may in fact be the nastiest level of the entire dungeon. Once you get through the Purple Worms—assuming you do—nothing else, no matter how bad or how nasty, will be quite as scary as watching far out ahead of you, in the waning light of your torch, for the flicker of purple that means Worms! Use the "DM Two-Step" here if you can, because the worms are fast enough to pursue you down the longest corridor if you retreat. Hit them with doors, use fireballs if you've learned that spell, throw boots at them, and, finally, if you need to, run back to the stairs and up to level 3 to rest. Thankfully, nothing will pursue you up a staircase. The Worm's bite is poisonous, and you'll need to use a "Cure Poison" potion to cure your champions. You'll also encounter Rockpile monsters and Screamers on this level, but that isn't the worst of it. There are three places where the each of the monsters can regenerate if you take too long getting through the level. If you retreat too often, you may find yourself fighting your way back through more monsters each time Worse yet, you may find yourself retreating from Rock monsters and suddenly encounter a group of Screamers behind you. Oh yes, this is a bad level! The one good thing about level 4 is that, near the end of the level, there is a room where Screamers regenerate. If you walk away from the room with the door left open, you'll hear the rattle of the door closing when you're a little way down the hall. If you return to see what's going on, you'll find that there's another group of Screamers in the room. You can repeat this process as often as you like. This not only gives you an unending supply of food, in the form of Screamer Slices, but it gives you a golden opportunity to get some fairly safe fighting experience for your weaker characters and to advance to higher levels for your strong ones. Be sure to close the door behind you when you go into the room, though, so that you don't suddenly find a stray group of Purple Worms chewing on your backside! If you take much damage while fighting the Screamers, you can always just sleep in the room, with the door closed, to regain your health. Further down level 4, you will find the Prisoner. Unfortunately, his fate is sealed when you realize that the floor plate he is standing on is what is holding shut the iron grating which blocks the stairs to the next level. Be well rested and healthy when you get to this point though, because the worms aren't through with you yet! Level 5 presents you with another set of rooms, with even more difficult puzzles to solve, to get into the Treasure Stores. These puzzles will require a lot of patience to solve, as most of them involve finding a pattern of buttons or movement. In addition, you will meet two nasty new creatures. The Flying Rattlesnake is fast and poisonous. Luckily, a fireball will take care of him—if you're fast enough. The other new creature looks for all the world like a deadly Gumby. It's poisonous, too, and has the nasty habit of throwing fireballs back at you. One nice thing about level 5 is that there is a stairway up to a secret door on level 4 near the Screamer Regeneration room, and there is a hidden doorway near the end of level 5 that connects back to the beginning of the level. This way you can make a quick trip back when you need food. An even better plan is to throw a good supply of Screamer Slices down the stairs, out in front of the party as you go. This way your food supply is always close at hand, and your characters will get a lot more Ninja level practice. Some of the items you find in the Treasure Stores will be needed on level 6 in the Riddle Room. Here you will find four riddles that you have to answer by placing the correct object in a niche in the wall next to each riddle. You only need to correctly answer three of the riddles to open the door into the rest of the level, but you get a bonus if you answer all four. The answers are fairly logical, and shouldn't be too much of a problem if you think of them in terms of the items you've found. Don't be afraid to use something which appears to be important to the party—as you can take it back once the door is open. This level presents some of the most difficult puzzles in the dungeon. One of the toughest is in a room near the Riddle Room. This room has a door that closes when you approach it, a transporter mist controlled by a lever, a pit and several floor plates. To solve this puzzle, watch carefully to see where you are transported; then watch what happens when something else is transported. In the King Midas room, find a way to give the King some gold. The Combination room requires patience. Later, when you find a tiny floorplate that you can't keep depressed, try to get someone, or something else, to stand on it for you, then find a way to freeze them in place temporarily. You'll then find yourself locked between closed doors, with a blinking transporter facing you. This is another place where fast movement is necessary. Practice the timing of the transporter and use magic to open the door behind it. Lighten the load of the Champions, and you'll get it. Incidentally, just a little before this area is where you'll want to look for that hidden Vorpal Blade. When it's time to "Test Your Strength," look around the corridors a little first. Then when you've tried to get yourself, or something else down the "Test" corridor, look around again. You may find that you've passed the test without knowing it! This level introduces you to bands of Skeletons, which can be fairly easily killed, and the golden Eyeballs, or "Beholders." Watch the pupils of the eyeballs; when they turn red, get ready to duck! There are Giant Wasps on this level too. You'll already have made their acquaintance, back on the Purple Worm level. Use a low level fireball on them, but be quick about it, because their sting is poisonous! There's one more place where you need to move quickly, but by now you should be able to handle it easily. Level 7 is a important level, but for now you won't be able to get into much of it. The keys you need are buried deeper in the dungeon. Level 8 is one of the most devious traps in the entire dungeon. Unless you can find a way to shut off the incessant rain of fireballs, you may not survive for long. Luckily there's an Altar of VI back up on level 6! This level is important because it's at the top of the Express Stairway which runs down the "back way" to all lower levels. You need to find the Skeleton Keys to open the doors to this stairway though, and the doors can only be opened from within the individual levels. Watch the walls for the places to use the Skeleton Keys; they'll be obvious. This huge open area is populated not only by Mummies and Skeletons, but by the Green Ghosts or Banshees that you first met on the Purple Worm level. Since they are non-material, you'll need to use either a magical spell to weaken them, or the Vorpal Blade to kill them. Also, for the first time, you'll meet the annoying giggling Thief. This character won't hurt you, but will steal things right out of your ready hands and run away with them. He can be killed easily, but will lead you on a merry chase, usually right into the clutches of something a lot more deadly! Try not to carry anything in the champions' left hands while on this level. If he steals your torch, it'll get dark all of a sudden, and you won't be able to see to catch him. There are quite a few hidden doors all around the outside edge of this room, so be very observant. ALEX NEEDS FLASK IN HAND FOR POTION. Most of the lower levels of the dungeon simply introduce more deadly monsters and more intricate and clever puzzles. By the time you've gotten this far, there shouldn't be much you can't handle, given plenty of resting and hiding. Level 9 has a couple of places where you may need a hint or two though. When you read a riddle engraved in the wall, think about what the wall is made of, and then imagine what you could do if that wall wasn't really there. Don't get a headache from beating your head on the wall, but give it a try a few times nearby. You must find the Corbomite to proceed through this level too. When you find it, examine it closely so you don't overload whoever has to carry it. Finally, by now your party should be strong enough to survive a jump into a pit. You'll need to do that to get past a closed door on this level, but you'll have to do some climbing first. There are three notable locations on level 10. The first is the puzzle that faces you right at the beginning. The area at the foot of the stairs is trapped with transporters, and there is only one path through the blocks which will get you to the other side. The message on the wall "gives" you a clue as to the "shape" of the path you must follow to get through. Once you get through, you are faced with two doors and only one hard-to-see key. Choose either one; they both end up at the same place. The only difference is the monsters you'll encounter behind them. They'll bring you out at the Zoom room, which is one of the most fun places in the dungeon. The key to getting off the "merry-go-round" is timing. Count how many steps there are in a full circle, then jump off when the door comes around. If you want to try for the niche with the objects in it, be warned that if you miss and fall into the transporter mist, you'll be sent all the way back to the beginning of the level. This level will present you with the nastiest monsters since the Purple Worms, in the form of Scorpions. One big problem is that they regenerate almost as fast as you can kill them, and their sting is very definitely poisonous. This is a good area to run like heck past them! Unfortunately, the Skeleton Key door to the Express Stairway is back in their domain, so you'll have to return to the area. But when you do, you should notice a difference. You'll need to examine the walls in this area anyway, because there are some valuable items hidden on this level. The Clockwise room on level 11 is one of the strangest puzzles in the dungeon. You'll need to go forward and backwards, both clockwise and counterclockwise around the room before you'll get out. Watch the floor for keys, and leave the items you'll find in the corners to mark your progress. Once you get out, you'll find the Diamond Edge Sword down a long passageway with ominous looking holes in the walls. Be prepared to hold your breath a long time once you pick up the sword. A hint for surviving this trap: The trap is triggered by the sword, not by you. If you drop the sword and jump back, things will clear up soon, and you'll be able to repeat the action. Nearby is also the Fury Sword which throws a limited number of Fireballs. This is nice for times when your magic users are exhausted, but try to save it for later when you'll really need it. Later on this level you'll again be faced with a "Let's Make a Deal" situation of three doors and only one key. (The key, again, is grey on the grey floor in front of the doors.) All three doors eventually lead to the same place, but one is fairly safe. Through another you meet the "club" and the last is a real "hornet's nest." If you ever need help deciding which way to go, you can place a coin in your action hand and flip it; but in some cases, like this one, the most direct approach is the safest. Hopefully, you've thought to bring along all the coins you've found, because near the end of this level is a room full of "slot machines" which will reveal all kinds of goodies. Also hidden behind an illusionary wall near the end is a pair of Boots of Speed. They're hard to find, but very valuable! The last puzzle on this level is one worthy of Sherlock Holmes. You'll need an item that he would carry, from the previous level. The item revealed by this puzzle is absolutely essential to the game! 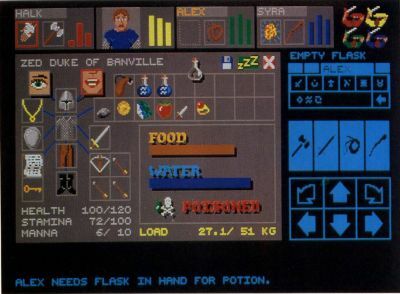 The most notable feature of level 12 is your discovery of the Knights. These animated suits of armor are one of the most fearsome looking of the creatures in the dungeon, as they each wield two swords. They can cause a lot of damage and are hard to kill. If there was ever a place to use a door as a weapon, and those Magical Boxes you've (hopefully) been saving, this is it! When you do manage to kill the Knights, be sure to sift through the wreckage, as you never know when something may be carrying an item you might need. By now you should have a rope, which you'll need unless you discover how to turn off the invisible pits you'll unexpectedly find. Some things in the dungeon are "toggled" on and off by the same control. When you fall into the pits, you'll have to fight a Fire Elemental to get back up. Again, this is a non-material being. More semi-non-material beings on this level are the Materializers, which slowly appear from just a faint blue globe of light, to a fuzzy outline, and finally to their disgusting solid form, and then back to almost nothing again. They can be hit by normal weapons only when they are fully materialized, so just go after them with your Vorpal Blades. Be wary of them though, because they use both Fireballs and Poison Clouds against you. Once you're past the Spider parade, you'll see a closed door at the end of a corridor. This is the Spider Regeneration room, where death awaits. There are a few useful items inside, but unless you can freeze the Spiders in their tracks, the items may not be worth dying for. Be careful because that room is a trap. If you get too close, you may end up having to fight the Spiders anyway. The last hurdle on this level is another test of your quickness, beyond which there is one more key that is essential to the game. Level 13 is where Lord Chaos lives. You won't be ready to fight him yet, so it's a good idea to just skip this level for now. He's not alone on this level either! The last level in the dungeon is the lair of the Dragon. He is incredibly tough and incredibly dangerous. Piles of ashes, which may be all that remains of other foolhardy adventurers, are strewn around on the floor. It's a good idea to investigate these ashes; you might find something important. The Dragon can be fought with the same move, turn, hit, move, turn, hit technique as the Purple Worms. Just be careful not to slip up and end up facing him! One blast of his fiery breath may be enough to kill most of your party. Once you kill the Dragon, you'll be set for food for the rest of the game. You should now have all the keys necessary to go back up to level 7 and investigate the Wizard's Workshop. Use the "backstairs" to go directly up to level 8; then run quickly back to the stairs up to level 7. With the RA keys, open the shimmering force-field doors; then with the Ruby Key, enter the workshop. Inside you'll find all kinds of useful things and many "red herrings." Be sure to read all the scrolls you'll find, as they give hints about what to do when you meet Lord Chaos. Search this area meticulously because you still need more keys. There are four Turquoise Doors and only one Turquoise Key, so again, it's pick-a-door time. A hint about these doors: To see what's behind all of them, you can save the game before opening any of them, then restart the game from that point. Some of the items are more useful than others. With the last RA key, find your way to the Tomb of the Firestaff and unlock its door with the Master key. Oh yes—those giant Stone Golems. They'll try to keep you from taking the Firestaff, but they are slow so you should be able to outrun them. But they are hard to kill! Again, bashing with doors and freezing with magic is a good way to approach them. Once you have the Firestaff, you need to find the Power Gem to energize it. If you were lucky on the Dragon level, you may have already found it. If not, go back to the Wizard's Workshop and locate the secret exit directly down to the bottom levels of the dungeon. If you search carefully near that exit from the workshop, you'll find an interesting key which will let you out at the bottom of the Express Stairs. Once you find the Power Gem, there will be a scroll nearby which will tell you what to do with it. Before you do anything, though, be sure that you have all the water and food, and whatever else you think you may need, to finish up the game. Once you free the Gem, all exits back to the upper levels are sealed. When you've freed the Gem and assembled it with the Firestaff, you'll be ready to go back up to level 13 and face Lord Chaos. The Dark Lord cannot be destroyed. Your mission is to capture him and recombine him with the good side of your master, restoring balance to the world. Thus you have to use the powers of the Firestaff to cage him and then fuse him. This is easier said than done, because he has an annoying habit of transporting out of your cage just before you can get him. If you watch how he moves though, you may notice that he always walks in the direction he's facing, even if there's a completed Fluxcage there. Of course, Lord Chaos is not alone on this level. While you're dancing with him, you'll also have to be dealing with the Demons which are wandering around and the Black Fire elementals that block your path. Luckily the Firestaff has an option which will help you deal with these too. This last level may take you some time to get through, and the function of all the coins laying around on the floor in the Dragon's room will become apparent once you notice that there's an Altar of VI behind the door you have to pay to open. Hopefully, you brought lots of coins down from other levels too. You can only save one game per disk, so it might be a good idea to dedicate several disks to the game while you're playing. You can rename and copy several saved games onto one disk, but that can be a lot of hassle. By having several disks to save to, you can always go back to an earlier saved game and try things differently without having to exit to the Desktop and rename anything. If something nasty lurking just around a corner should take you and your party by surprise and wipe them all out, you'll be able to start over from a point fairly close to there if you saved the game! Hopefully this tour of the dungeon and the hints presented here will make your stay in the world of Dungeon Master more enjoyable—not to mention a little longer lasting!.